New Garden Hose Quick Connector. 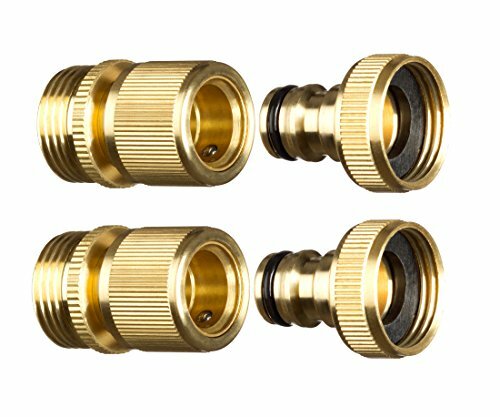 ¾ inch GHT Brass Easy Connect Fitting 4-Piece Set Male and Female by GORILLA EASY CONNECT at Halo Grow Box. MPN: 4336485422. Hurry! Limited time offer. Offer valid only while supplies last. Why Purchase the New Garden Hose Quick Connector by Gorilla Easy Connect? It's the #1 Strongest ¾ inch GHT Brass Easy Connect Fitting on the Market. Why Purchase the New Garden Hose Quick Connector by Gorilla Easy Connect? It's the #1 Strongest ¾ inch GHT Brass Easy Connect Fitting on the Market. With its rust proof and reinforced solid brass design, it withstands being run over, trampled on and can resist excessive weather environments that prevents wear and tear for many years. With a ribbed exterior design, it allows ease of gripping the valve to connect or release to a water hose, sprinkler, water nozzle, spigot, pressure washer or any other garden accessory with ease even when wet. You no longer have to worry about getting wet unscrewing your hose or accessory anymore. With the spring loaded mechanism makes connection or disconnection fast and effortless especially for those with arthritis and limited hand and joint mobility. It's perfect for power washers, boats, RV's, campers, garden and tree soakers and anywhere else that accepts a standard 3/4" garden hose connection. 4-Piece) Set is complete with 2-Male and 2-Female standard ¾ inch GHT (Garden Hose Thread) valve that can easily be interchangeable with an assortment of garden accessory. Is No hassle with bulky or heavy fitting valves, the Gorilla Easy Connect weighs only 6oz and its dimension is 2.5" x 1" and withstands 200 PSI of pressure. If you have any questions about this product by GORILLA EASY CONNECT, contact us by completing and submitting the form below. If you are looking for a specif part number, please include it with your message. COLIBROX--Folding Fish Table Hunting Cleaning Cutting Camping Sink Faucet w Sprayer New. goplus folding portable fish hunting cleaning cutting table camping sink faucet. best fish cleaning table.